Coconuts and peanuts are great if you are trying to lose weight. Is weight loss your new health goal? During weight loss program, many people may crave for something sweet. Well, sweet does not mean a chocolate bar, ice-cream or a candy. Even if you crave for something sweet you should look for something healthy and nutritious in order to satisfy your sweet tooth. Recently, Shilpa Shetty Kundra in her Facebook video makes an easy, delicious and a sweet dish which can help satisfy your sweet cravings. Even better, the dish will not hamper your weight loss goals. 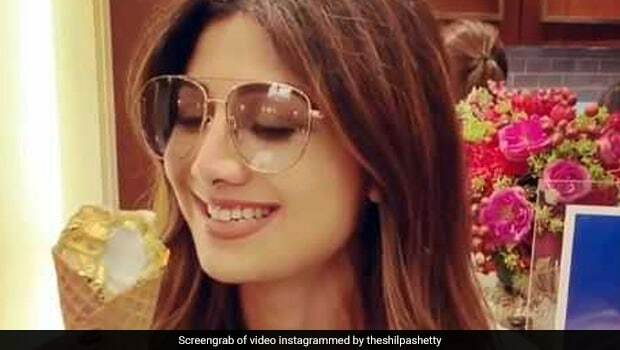 Being a foodie (take a look at her Sunday binges) herself Shilpa Shetty has always inspired us to follow a healthy lifestyle. She always tries to make something healthy while extremely delicious. In the following article, we explain to you the many benefits of the dish she recently made. The name of the dish is coconut peanut bars. Her Instagram post said, "This dish will not only satisfy your sweet tooth but will work as an instant energy booster as well. It's called Coconut Peanut Bars. This high in protein, mouth-watering sweet dish is a great way to start your festive day and can be stored for a few weeks too." Coconut offers a wide range of benefits to nourish your body while delighting your tongue. Raw coconut is rich in dietary fiber, which can boost health by normalizing bowel movements, reducing your risk of hemorrhoids, stabilising blood sugar levels, lowering blood pressure and cholesterol levels in your blood stream and keeping you satiated for a long time. This in turn, makes it perfect for those who want to lose weight. Coconut is also rich in medium-chain triglycerides, a type of dietary fat that may help in quick weight loss. Medium-chain triglycerides convert into monoglycerides and medium-chain free fatty acids during digestion. These two substances in your body use energy rather than storing as fat. The healthy fats in coconut may promote a healthy body weight and help you shed those extra kilos. Another ingredient that goes into making this dish is peanuts. Peanuts are rich in monounsaturated fats. This fat is extremely beneficial for maintaining a healthy heart. Peanuts can keep you satiated for a long time and help in maintaining weight loss. In addition, peanuts are rich in essential vitamins and minerals like niacin, folate, pantothenic acid, thiamin, riboflavin, choline, Vitamin B6 and Vitamin E, magnesium, phosphorous, potassium, zinc, iron, copper, manganese and selenium. This dish is extremely simple to make. Simply take a healthy fat like ghee to make the dish. Add jaggery to ghee and let it melt for sometime. Then, add coconut and peanuts to the mixture. You can even add some other healthy nuts and seeds to the dish like cashews, almonds, dried figs, flax seeds and many more. Mix in all the ingredients and let the mixture cool for sometime. Once the mixture is set you can cut it into small pieces. With no refines sugar and all the healthy ingredients, this dish is perfect if you feel like having something sweet. You can store it and have it in your morning breakfast, while you are travelling or even as an evening snack.